Check out the Cleng Peerson Farm FaceBook page for great content. A reprint of the May 23rd post can be found here. This entry was posted in General on May 25, 2018 by Kirk Mies. Today is the Norwegian National Day, better known as syttende Mai, in which we commemorate the day Norway’s Constitution was signed in 1814, in effect declaring the country and independent kingdom. Below is a link to a great article published in The Norwegian-American entitled, “17 Ways to Celebrate”. Enjoy! This entry was posted in General on May 17, 2018 by Kirk Mies. 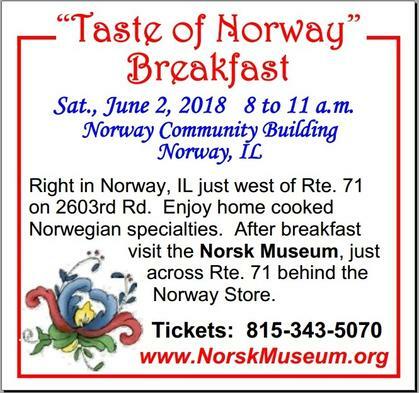 Join us on Saturday, June 2nd for the 2018 opening day at the Norsk Museum. Featuring Norsk dancers, hardangar fiddles, and rosemaling demonstrations! Not to be missed! This entry was posted in General on May 4, 2018 by Kirk Mies. The Restauration is at Risk!